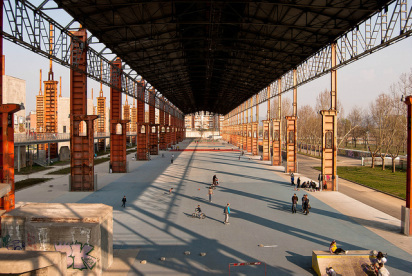 The “Dora Park” is a post-industrial urban park situated in Turin, closed to the historical city centre. It represents the heart of the so called “Spine 3”, a huge area of more than 1 milion m², where big factories as Fiat Ferriere, Michelin, Savigliano and Paracchi were settled in and took advantage of the proximity to the river and the railway. The whole park, that covers an area of 456.000 m², takes its name from the Dora Riparia river which crosses the area from west to east. The surrounding suburbs, as San Donato and Campidoglio in the south, Lucento and Madonna di Campagna in the north, became the centre of the Turin fourth class. The entire area is regulated by the Urban Requalification Program, approved in the 1998, which engaged both private and public resources. In the 2004 an international contest for the park was opened; the selected winner project was the one of the working group managed by Peter Latz, just creator of the Landschaftspark in Duisburg Nord, in the Ruhr basin. Therefore, the area of the park was divided into five parcels: Vitali, Ingest, Valdocco, coinciding with the three different names of the Ferriere Fiat factory, Michelin and Mortara. The project for the area includes also three infrastructural works: the new railway bypass, new underpasses and the new bridge over the Dora river. All the parcels assimilate natural landscapes and preexisting redeveloped structures of the ex factories the huge framework of the Fiat steelworks. The first parcels were inaugurated in the Spring 2011. In the last thirty years the image of Turin has been involved into an overall revisitation due to the presence of several ex industrial settlments, in quest of a new historical and cultural identity. The comparison with the industrial past and the metamorphosis of the land are the main components of the project. The Dora Park represents one of the most important interventions in terms of sustainability approach. The thread of the project is to preserve the genius loci of the area, maintaining a close relation with the post-industrial landscape and using the river as the essential structure of the proposal. On the one hand the reuse of the ex factories’ framework, maintaining for instance the pillars and the tin roofs, as pavillons where playgrounds and bothanic gardens are located; the achievement of new pedestrian and cycling paths that allow the entry, the crossing of the area and the direct connection with the city centre. On the other hand the total demolition of buildings leaving space for green areas and revegetation; the use of parts of the factories, like the cooling Michelin tower, as landmarks. At the same time the frameworks open the possibility of different purpose as places for concerts, exhibitions, house of prayers and sport contest.